If you are thinking about investing in gold bullion you have many choices possible. One of these is Canadian gold bullion, and this is a preferred investment for a lot of people. One benefit of the Maple Leaf gold coin from Canada is that this coin is the purest gold coin minted anywhere in the world, at .9999 pure. No other coin can match this number, regardless of minting origin. Canadian Maple Leaf gold bullion coin is considered a collector’s item by many, but it also has many other benefits and may be purchased solely for investment reasons as well. Canadian gold bullion in this form is legal tender, and offers a face value of fifty dollars for the one ounce version, although the value of the gold content is many times that right now. Moreover, these are one of the nicest looking bullion coins in the world and are favored by numismatists and investors alike. Owning them comes with a double benefits of gaining high collector’s value on top of owning physical precious metal. Buy there’s more in terms of benefits, these coins are struck with the purest 24k gold delivering the finest and the best grade of this precious metal. With the purity comes a drawback of less resilience and susceptibility to scratching, therefore, handle your coins with love. With the rising gold bullion price today you may be tempted to invest just like everyone else, and you may wonder why Canadian gold bullion coins are a better option. These coins, like many others, are easy to store, and you can transport them with little or no effort. In addition the maple design will be recognized instantly anywhere in the world, making it a secure form of wealth no matter where you are. 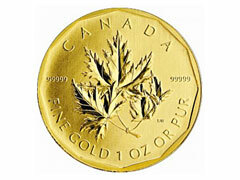 The gold Maple Leaf price will include a small premium, just like any other form of bullion purchase. This form of Canadian gold bullion has complete liquidity, and can be sold to any precious metal or coin dealer in almost any country. American Eagle gold coins are another choice for investors, but these coins do not have the same purity. Small amounts of other metals are added to the Eagle coin for durability, so the purity is less than point nine two percent in the finished coin. Because of this most investors prefer the Canadian Maple Leaf coin instead. However, Eagle coins do not scratch so easily and stay in mint condition for longer.